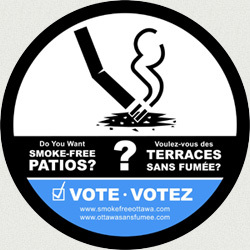 Thank you to everyone who responded to our online poll about smoke-free outdoor spaces in Ottawa. "Have you ever pulled a small child away from the play structure when he wasn't ready because he can't breathe? It's heart-breaking. My child has the right to play wherever he wants, and shouldn't have to avoid parks because of smokers." "I used to play soccer and couldn't stand it when spectators or players smoked on the side-lines! Breathing in that smoky air while I ran was disgusting."